I already have an article dedicated to Roulette Bets however I was asked to go into more detail about each bet. So I decided to split it up with this article on inside bets, and then another article discussing the outside bets. 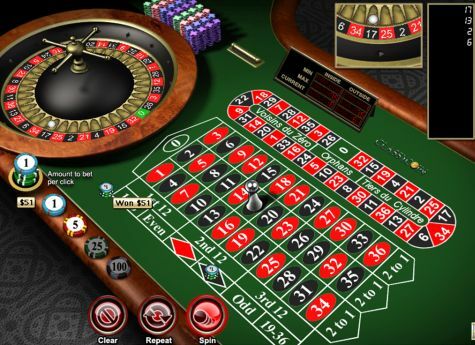 We’ll cover them in detail now using American Roulette odds. Please note that of course you can place the bets up until “no more bets” is said and that covers everything – be it inside bets or outside bets. The most common and simplest bet to make inside – you’re betting on the number that will hit on the very next spin. Odds are 35/1. With 36 numbers to choose from – let’s say you want to go with your lucky number, which is 23. You would place the amount you want to bet on 23. We’ll use $10 for all examples. So you place $10 in chips down on the number 23 on the betting area. After the spin is completed, if the ball landed on 23, then you win $350. If it lands on any other number, you lose that bet that you placed. The split bet is very similar to the straight bet – except you are betting two numbers, not one. When you go to place your bet down, you will put it down on the line in between two numbers. So for example – 28 and 31 are beside each other. If you placed $10 down in between 28 and 31, on the line in between them – that would mean you are betting on both of those numbers. The payoff is 17/1 so a split bet of $10 on 2 numbers will get you a $170 payout if one of the numbers come in. Similar to the above two – except in this one, you are now betting three separate numbers. This is called a trio bet usually, although you may hear people refer to it as a “street bet” or “stream bet”. Okay so see the rows of 1,2,3 or 4,5,6 or 19,20,21? That’s the sort of “trio” that you can bet on. You would place your bet on the line at the very end of the row. So if you were to bet 19,20,21 you would place the bet on the line beside 21, and the green area. Payout for these bad boys is 11/1 and is a very popular bet. $10 would get you $110 for example, if you bet 19,20,21 and either of those 3 numbers came up. Noticing a trend? I hope so. We are going up 1 additional number at a time, all the way to 6 numbers. This one is very simple – and is often referred to as a square bet. You put the chips you wish to bet on the very corner where four numbers are touching. So you could bet 22,23,25,26 all at once by placing a chip directly in the middle of them all, so it is covering all 4 numbers. Note that often the croupier may ask for clarification about that bet just to make sure you are placing a four number bet. Payout for this is 8/1, so $80 on a $10 payout with 4 numbers covering you. This one is a lot more restrictive as you can only bet 0, 00, 1, 2 and 3. You can’t play any other numbers. To place this bet, you would place your chips on the sideline where the 0 and 1 or 00 and 3 touch. And hey don’t worry – if you’re confused about thios just ask the croupier or dealer where exactly to place the bet. Tell them you want the five numbers bet. If you hit 00, 0, 1, 2 or 3 then you win with a payout of 6/1. This one is a lot more versatile than the 5 number bet. You get to choose two rows that you can bet on. For example – 19, 20, 21 and 22, 23, 24. Payout is 5/1 which isn’t bad and it’s probably my favourite bet – I’ll always have money on 2 rows when I play Roulette. You would place the bet on the very side line, which is covering both rows so it is touching exactly 3 lines. Payout is 5/1 as mentioned.